As a business that is based in creativity, the culture and arts scene in our community is very important to us. We find inspiration from other creatives. We entertain ourselves by seeing amazing performances at the Strand Capitol. We add to our visual bank by enjoying the works of artists from other mediums. It’s been said that a rising tide lifts all ships and we feel that a rising creative tide lifts all creative ships. We were recently asked to create a video for the Cultural Alliance of York County’s Campaign Kickoff. We got excited about this for a few reasons. One reason was that we would have the opportunity to show our work to a number of community leaders. We were excited to find out we were given creative control of the direction of the shots on location, and production of the editing. The most exciting part of the project was being able to help an organization like the Cultural Alliance. 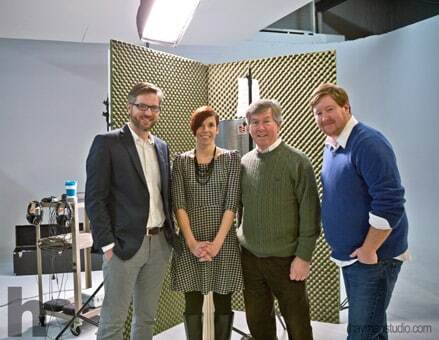 Gary and Ryan with Kelley Gibson and Dave Kennedy after Dave recorded the voice-over for the Campaign Kickoff video. The Creative Impact Awards are another way the Cultural Alliance serves the community of York. These are monetary awards given to programs or projects that benefit York County through the Arts. We thoroughly enjoyed working on this video and already have ideas for next year’s video. Thank you to the Cultural Alliance of York County for everything they do to add to the vibrancy of this place that we call home and love so much.